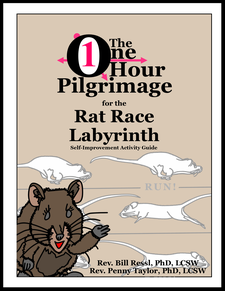 Adult Activity Guides come in Introductory Paths (aka The One Hour Pilgrimage series) and Intermediate Journeys. Our Family-Time Storybook to Color Adventures are for intergenerational enjoyment with younger colorists. Each is written and illustrated by Rev. Dr. Bill Ressl, LCSW and Rev. 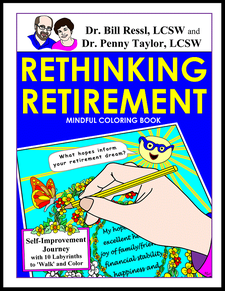 Dr. Penny Taylor, LCSW - and the product of over 30 years of research exploring life transitions through psychology, social work, pastoral theology, ritual studies, and life experiences. Every graphic novel coloring book we create includes a story to enjoy, drawings to color, hidden words and/or images to find, space to journal your thoughts, and custom labyrinths to finger walk and enjoy. Building off of Dr. Bill's early formative years and family tradition of visiting his grandparents and coloring around the kitchen table, our Family-Time Storybook to Color Adventures, for younger colorists, invites families to enjoy some family time - gathering together to read, color, and share stories. Each includes a fun story with additional opportunities to share ideas and thoughts with one another. 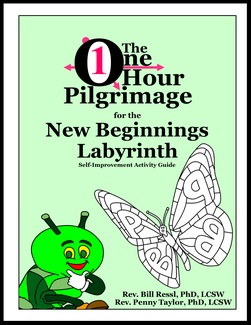 Each Introductory Path (One Hour Pilgrimage Activity Book) and Intermediate Journey Mindful Coloring Book is for the mature colorist. 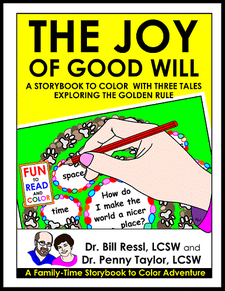 Each invites the integration of historic Christian practices of mindfulness with ideas from narrative therapy to create a self-improvement coloring adventure. Each Activity Guide we create includes a story with paths to color and custom labyrinths to walk with your finger. We hope you enjoy our Activity Guides as much as we have enjoyed creating them for you!